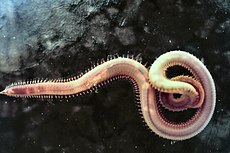 Annelids are a phylum of invertebrate worms. They are the segmented worms, with over 17,0000 known species. Annelids are made of one or more body segments. Each segment has one or more rings. These rings are called annuli (singular: 'annulus' = 'little ring'). They can regenerate cut off pieces of their body. Unlike sponges, which can come back together if ripped apart. They have a hydrostatic skeleton, a one-way digestion system, and bilateral symmetry. This page was last changed on 4 February 2014, at 14:24.